54 young athletes travelled to Two-Mile-Borris to take part in the County Even-Age Juvenile Cross Country Championships and every one of them gave it their all in support of their club-mates. In the very first race of the day Alana Spillane gave the club an ideal start with a great victory in the Girls U/10 event. This was followed by an equally good performance from Luke Walsh who won a bronze medal in the Boys event having finished an excellent 8th. Amy Reddan continued the good run for the club in the Girls U/12 race to also come home in 8th place and an individual bronze which was also the lot of David Doyle in the Boys U/12 where he finished in 9th place. At U/16 level Dylan McLoughlin ran a very sound race to finish 2nd and win a silver individual medal while the club won two individual bronze medals at U/18 level in the shape of Aoibheann Duggan and Nathan Bowe. To cap a good day the Boys U/12, Boys U/16 and Boys U/18 teams all won silver medals. As already mentioned Alana showed a clean pair of heels to all in the Girls U/10 race. She had 10 team-mates in the names of Dearbhla Gleeson (18th), Maebh Leahy (28th), Orla Duggan (33rd), Mary Kate Ely (34th), Mairead Duggan (45th), Sarah McGinley (46th), Emma Delaney (49th), Ciara Fogarty (50th), Isabella Jones (52nd) and Kate Delaney (54th). In the team event the Girls finished 5th and 9th. Continuing with the Girls, six represented the club at U/12 with Amy Reddan leading them home in a great 8th place. Saoirse Doran was next to finish in 12th followed by Blathnaid Lloyd in 25th, Marian Campion 27th, Una Duggan 32nd and Cara Delaney 36th to also finish 5th in the team event. Unfortunately for the Girls U/14 we had only three athletes so no club team to compete with the other clubs but Helen Cleere, Aoife Dwyer and Emma Leahy gave it their all to finish 6th, 16th and 22nd. At U/16 level it is only three athletes to score on a team so Emma Gleeson, Shannon Boland and Aisling Dwyer fought it out with the other three clubs for the prizes but despite finishing 7th, 12th and 13th they had to settle for fourth place. As already mentioned Aoibheann Duggan finished third in the U/18 race where she was our only representative. In the Boys U/10 race, following the great run from Luke Walsh in 8th, Jack Reddan came through for 16th, Sean Boland 30th, Rogan Lyons 35th, Shane Burke 49th and Paddy Ely 53rd to finish 5th in the club event where eleven teams were entered. The biggest representation of the day for the club came in the Boys U/12 race where 14 athletes togged out. David Doyle with his great run in 9th led them home with Cathal Guilfoyle in 14th, Lorcan Burke 18th and Adam Phelan 20th to win the first set of team medals of the day and silver was their lot. Jack Gleason in 24th, Cormac Burke 25th, Jack Flanagan 27th and Frank Doyle 31st finished 5th in the team competition while Jimmy Campion 36th, Ben Moore 38th, Sean Lyons 39th, Liam Ryan 42nd and John Delaney 44th finished 7th in the team event. 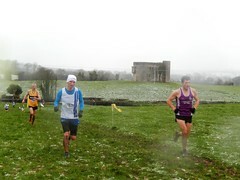 Hard luck to Adam Spillane who was going so well but was unable to finish due to illness. Better luck for him the next day out. At U/14 level the competition is still as keen as ever but fair play to Aaron McLoughlin 13th, Jake Bowe 21st, Liam Ryan 25th and Kian Dunne 26th who all put in great performances to finish just out of the team medals in 4th place. As with the girls only three members need to score at U/16 level and with Dylan McLoughlin getting them off to a great start with his second place, Gavin Ryan followed his lead to finish 4th and Eanna Guilfoyle came through strongly for 8th to finish on 14pts the same score as the winners but as their third athlete home was in before Eanna they boys had to settle for second team. The same misfortune beheld the Boys U/18 team of Nathan Bowe, Bill Hogan and Michael O’Mahoney who also tied in the team event. As already mentioned Nathan finished an excellent third for his first ever individual bronze medal at county level followed by a very strong run, particularly in the second half of the race from Bill who came 4th with Michael back in 11th to finish on 18pts. Again the winning club had the same score but as their final athlete finished in 9th the boys had to settle for silver medals. What a performance from all of our athletes on this the first day of competition, 1 County Champion, 1 silver medallist, 5 bronze medallists and three sets of team medals. Hopefully we can continue this into the second day of competition on 15th October in Galbally. Well done to all our athletes, you did yourselves, your families and the club proud by your performances.